I searched for about 5 minutes until i saw her running around and going up and down the staircases of several apartment homes. I figured she was a stray because she was so small and skinny; she didn't look cared for. There are many stray cats around these apartments but this particular one caught both me and my family's eyes. My mother was never a big fan of cats. She would complain about the hair and the litterbox and the constant care, monthly vet checks... it was a hassle to get her to like cats. We had thought we'd lost hope. Until that day, The first day i held 'Turkey' In my arms and brought her through those doors. My mother's face lit up brightly and she couldn't help but to scream in awe, "Oooh!! Look at her little white feet!!" as she held the kitten close. That is when i knew she would become a part of the family. We did not have any food at first so I rushed to the house next door; Knowing they have cats and were kind people. They thoughtfully gave me just enough food to last for 2 days while my mother gathered enough money to buy 'Turkey' all of the essentials such as a litterbox, food, toys, etc. **Now you're probably wondering why we call her 'Turkey' right? Well, I'll tell you. :)It's an interesting story. The very night we brought her home, My Family decided to make sandwiches for dinner. As you are probably already thinking "They fed they're cat turkey?" We did, In a sense. :P They were "turkey" sandwich slices from a local Krogers. As soon as we opened up the turkey package the cat went crazy! she adored the taste of those fresh turkey slices. That is why we named her Turkey, Because she was crazy for turkey slices :P and also because it was the first human food she had ever eaten. Her original name was commonly known as "Socks" of course, due to her white feet. We slowly fell in love with her as she did with us, She thanks us everyday as we wake up. Greetings us with a good morning "Meow" and a hug. She adores hugging everything. She will hug tables, Legs, Faces, Anything put in front of her. She would hug before she did anything further. That's one of many reasons we kept her. She is the family cat, No cat can replace her. We rescued her and she rescued us. Tuxedo cats are indeed very talkative and very intelligent. I'm glad that she is with us now. 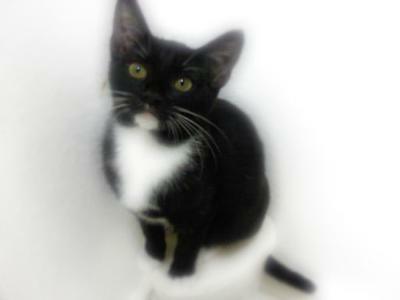 This is our very first tuxedo cat and we are pleased (: In October when she is fully grown, We will get her fixed. In December we plan to buy her a collar. We have never done that for a cat before. I know collars should have been introduced to her at second glance but we wanted it to be a loving christmas gift (: and we wouldn't have to worry about changing it up because she would be fully grown. It is safe to say, I love her. I would not know what to do without her. She is my companion both day and night. Oh! and as you can probably tell in the picture above, She adores sitting on the top of her water bowl! So very adorable! What a wonderful story. I believe that cats actually choose their human parents, even though it may seem the other way around. I'm sure Turkey had been looking for her perfect family and she found it! I'm so glad your entire family fell in love with Turkey. She's truly adorable. And I laughed out loud when I read about her taste for turkey. So funny. Thanks again for sharing your cat's story.